I am counting this as my tribute to, you, the Youth Pastor for Pastor Appreciation Day. Why? Because many of you did not feel appreciated. Some of you barely got a pat on the back or maybe a back handed compliment. Granted, youth worker status has grown over the years I keep hearing stories of small minded, small hearted churches who want something for nothing. This is one I heard out of the gate. I made a commitment early on to the the hardest working youth pastor out there. No one would be able to point there finger at me and say, “H doesn’t do anything”. I stand by that commitment today. 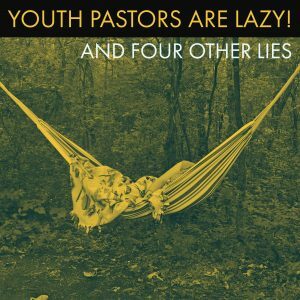 Youth Pastors are not lazy. In fact, beside the pastor, they may be the busiest person in the church? Why? Beause stuff gets dumped on their plate. We get many of the jobs we’re given because we have the most energy and most know how. Sound like lazy to you? This is only partially true. Think of the group we work with? They like things like Adventure Time, Anime, and a hundred other things that we try to connect with students over. Maybe what people perceive as childishness is more like child-likeness. Jesus bent down to hug a child. Some older youth workers, like myself, have to bend down to relate and to receive the average teen. Do we care about every cartoon and new fad to come along. No. Some younger ones do not either. Now, if your church has hired someone between 20 and 25, you have a person whose brain, biologically isn’t even fully developed. There is going to be some immaturity and some growing pains. Youth Workers are in the trenches and are wear angels fear to tread. Be thankful it’s not you going to stand before an audience of tough critics and pray for those who do. This is also partially true but only because we may be the last risk takers in the church. Yes, I’ve heard the complaints about how we use culture and how worldly we are. That aside, we are mostly in trouble for reaching the unreachable. We want kids who have never heard or understood the gospel before and to receive Christ as Savior. I’ve gotten in trouble for ministering the “trench coat gang” back n the day. Ive gotten in trouble for skaters as if I invented the skateboard and handed it out to every kid in the neighborhood. These things are too small and insignificant to get in trouble over. Let’s save all the trouble for the most important thing, reaching students no one else wants. Yes, youth pastors can become myopic and have tunnel vision, but what do you expect? Most youth workers do not attend an adult Sunday School because they are busy teaching one. The are not part of a small group because they are teaching one. They only have roles and responsibilities that are for geared toward youth ministry. Maybe adults are afraid of us. We are mutants who can communicate with teenagers. We are not allowed in board meetings or special meetings to help steer the church because….. Right, that’s what I thought. You can’t pay a youth pastor for caring about youth. We would do that anyway. It’s in our DNA. If a church will expand the roles a youth worker into credible areas of responsibility, they may care more about the rest of the church and actually have some good ideas and possible solutions. This is 100% true. But we are not rebellious against church authority, or the Bible, or people, we are rebellious again averageness. We are rebellious against hypocrisy. We want the “real church” to step up and step forward. Why have a generation of NONES (those who claim no religious” affiliation said that they do not want to be part of a church? For the same reasons. Most of them are not rebelling against God, they are rebelling again religion. Many Youth Pastors have become a part of the NONES. They quit and never went back. I was almost one of those many years ago. Now, as many youth pastors do, we fight from the inside. We prayerfully rebel against the onslaught of negativity, conformity. and apathy and teach our students to walk in the steps of our Savior who did the same. Giving up a portion of your salary every week to fund the youth ministry because the church won’t give you a budget. Taking the heat for that kid when everyone else wanted him gone. Loving kids who do not love you back. The list could go on and on but I think you get it. I appreciate you and I fight for you and by your side every day. Any other lies you can mention? Leave them in the comments below.